In all of our Churches the day of Pentecost was marked with an important question: what does it mean to have the Holy Spirit within us? What difference does he make to our lives? One of the things we have been thinking about recently is how we move from ‘maintenance’ to ‘mission’. Having come through an important time of dealing with all kinds of ‘in-house’ issues, the time is now right to allow God, who always looks outwards, to draw our attention away from ourselves and think, once again, about our neighbours and friends, those with whom we want to share our Easter message of new life and hope. It is tempting, whenever we think of such words as ‘mission’ or ‘outreach’ immediately to start planning activities and events to which we can invite people. Such initiatives are a great way of welcoming newcomers… as long as they respond to the invitation! We have to be careful, however, not to become so busy that we have no room in our lives for the ordinary meetings: conversations at the school gates, walking the dog, and bumping into people in the shops or the Post Office. These moments are not perhaps as focussed as special services and events, and yet they are probably more important because they are when people see us as we are. It is not just when we talk openly about Jesus – or get the vicar to do so – that people encounter the Good News. The exciting fact of Pentecost (not just a single day in history but an ongoing event) is that Christ is with us, present even when we are least aware of him. What people see is much more than our words or our actions. What often leaves an impression is what we are like to be with. All those who are in Christ have this promise: that the Holy Spirit is in us, and is therefore present in every encounter that others have with us. It could even be said that the more we are truly ourselves with people, the more they will see of Jesus, through his Spirit. A reflection of Christ is in us… So many people on earth radiate the holiness of Christ without realizing it and perhaps without daring to believe it. And it is better that way. Create peace within yourself and thousands will find salvation around you. Please keep David and Sarah Gardiner in your prayers as they move from Cambridge to Prestbury during this month. David will be ordained Deacon to serve in our Team Ministry during the Ordination Service in Gloucester Cathedral on the morning of Sunday 29th June. Please pray for him especially as he prepares for this significant new chapter in his own Christian discipleship. There will be an opportunity to welcome David and Sarah during a tea party in the garden of Prestbury Vicarage beginning at 3.30pm. All are very welcome to attend. Andy Hughes will be ordained Deacon alongside David Gardiner on 29th June. Andy, who is a member of All Saints’ but is known to people at St Nicolas’ and St Mary’s, will serve in the Team Ministry on a non-stipendiary basis until December. He will then move to the Lichfield Diocese where he will take up a full-time post in the parish of Friar Park. Please pray for Andy as he prepares for ordination and welcome him in his new role. … and to Bruce Goodwin! This month we also welcome Bruce Goodwin who is joining us for a four-week placement. Bruce is a student at Trinity Theological College in Bristol and has just completed his first year of training for ordained ministry. Bruce commutes to Bristol from Prestbury where he lives with his wife and family, who usually worship at Trinity Church in Cheltenham. During his time with us Bruce will mainly be at St Mary’s and will be preaching for us on one of the Sundays. He will also be attending weekday services and other meetings and events to help him to ‘get a feel’ for parish life in Prestbury. On Tuesday 13th May Sylvia, Mavis, Jenny, Jean and myself went to Gloucester Cathedral by car on a beautiful summer evening to the above Mothers’ Union Festival Service. The Cathedral was full and it was a wonderful service with the display of Banners at the start and finish of the evening. The address was given by Elizabeth Brown, Provincial President of Canterbury Province. A Liturgical Dance was performed, copied with permission from Dornakal Diocese, South India, the four ladies dressed in traditional saris, having visited there a short while ago. The collection was for the Mothers’ Union ‘Away From It All’ Fund, which takes families on holiday who would not otherwise get a holiday at all. The theme of the service was ‘Time for Relationships, with God and Each Other’. An uplifting and inspirational evening. On Sunday 11th May St Michael’s Church, Whaddon, hosted a service to celebrate Pentecost and the commencement of Christian Aid Week. We were warmly welcomed by the Revd Robert Pestell. Prayers and readings reflecting the theme of Pentecost, serving others and Christian Aid were offered by the Revd Jon Morgan and the Revd Maz Allen of the URC and Prestbury and All Saints’ Team Ministry. The service was brought to a conclusion by a moving display of three silver flags representing the Trinity, to the singing of a traditional Celtic blessing. The final blessing was given by Fr Michael and the dismissal by the Revd John Wren from St Mark’s Methodist Church. Many thanks to all who helped with the house-to-house collection by giving, collecting and counting. As a result of your generosity the parish has so far raised £996 at St Nicolas’ and £4,804 at St Mary’s, giving a grand total for the parish of £5,800 to date. The final figures will be published next month. You may have seen in the publicity material that Christian Aid allocates 30% of its resources to emergencies and 40% to long-term projects like the provision of clean water and training and education. The terrible disasters in Burma and China have made us all more aware of the need for this two-pronged approach. Eighteen people attended the Quiet Day on May 10th and enjoyed a wonderful day in lovely surroundings, under the guidance of Father Paul. We were sustained by the hospitality of the Sisters and the day was rounded off with a Eucharist at which sacramental healing was made available. A special thank-you to Father Paul for his wise and gentle leadership. Thanks also to all who helped with organising the event and to those who joined in the fellowship, without whom the Quiet Day could not have taken place. For some people the thought of a quiet day is quite daunting. ‘What happens?’ I have been asked. ‘Do you sit in church in silence all day?’ ‘I’m frightened that I will disturb others.’ However, a quiet day is what you wish to make it. The Marist Convent at Nympsfield is an excellent venue. There are many places to go and sit quietly and read or think, a room to talk quietly while completing a jigsaw, colouring or drawing. There are also some good short walks that can be taken, as well as a garden to enjoy. The day was led by Father Paul. The theme Tongues of Fire was subtitled ‘a feather on the breath of God’ by Hildegard of Bingen. The day was divided into three sessions: Creation, Inspiration and Healing. Each session was followed by a time to be quiet, and the opportunity to explore readings and texts for ourselves. Father Paul encouraged us to think about how the Spirit is always with us, and that we need not only to release the power within ourselves, but also to recognise and acknowledge that it exists within us, and then to use the creative power of the Spirit. We need to remember that, as Christians, part of our vocation is to point everyone to what is good. That is the creative, strengthening and inspiring energy of the Holy Spirit which then leads us to praise God. We need to allow time in our lives to let the Holy Spirit speak clearly to us and to work within us, despite the things that we do in our everyday lives. The Holy Spirit sustains and heals us in a quiet way, the way of true holiness. Celebrate! is a service with adventure. Every week is different and this past week [the Sunday after Ascension Day] was no exception. We were greeted by ‘special agents’ (members of the Celebrate! 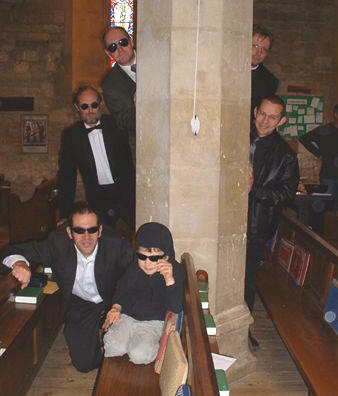 team dressed up as detectives with dark sunglasses). But what did it all mean? The agents were on a mission. We were all welcomed to join the discovery and the adventure began.There was a short quiz, pictures of all different special agents, James Bond, The Men in Black, and envelopes were scattered round the church. We were all agents on a mission to find these envelopes and solve the puzzle inside. Yes that was it, puzzles, different images of Jesus. Once completed they were all pinned up at the front of the church and we were the detectives looking at the clues.So what was the meaning behind all the evidence presented to us? Everyone is different, and Jesus appears to us all in different ways. We all have our own feelings and theories about God and Jesus. In our lives as we meet day by day we all build up our own beliefs about Jesus. Therefore, without realizing it, we are all God’s special agents, on a mission. Calling all special agents – rendez-vous at St Mary’s Church, Prestbury, at 9.30am on a Sunday to Celebrate! Fifty days after Easter the mission for this week [Pentecost] (if you chose to accept it) was to spread the word about Pentecost.There were several key elements to this assignment – making a ‘flame’ headdress, blowing bubbles in the wind, lighting a candle, drawing a picture of a dove, washing your hands in water, and spreading oil on your palm. Not forgetting, of course, the importance of worship through song and prayer. A critical mission for all agents to help us remember that the Holy Spirit is upon us, and to Celebrate the birth of the Church. On Sunday 29th June we welcome members of the new Beaver colony in Prestbury, who will lead a service with ‘Friendship’ as the theme. All are welcome to join us. On Sunday 8th June from 10.00am at St Mary’s Infant School. Informal Worship, Picnic, Games, Children’s Bouncy Castle. Please bring your own picnic food; drinks are provided. There is shelter available if it rains and we plan to finish by 1pm. At the Annual Meeting at the end of April we expressed our very grateful thanks to Jerry Porter who has served as Churchwarden for six years. Under new rules introduced in 2001, Churchwardens can only serve for a maximum of six years and then must ‘rest’ for two! Jerry has given very generously of his time despite a demanding full-time job. He has brought to the role great wisdom, his skills of leadership, the ability to bring clarity to discussions where there is confusion or uncertainty and to put into words things others have struggled with. Through his commitment to Celebrate! (which will continue!) Jerry has demonstrated his concern to bring new people to an understanding of God’s love for them revealed through Jesus and of welcoming them into the Church family. All this (and more!) has been done with his customary humility. Thank you, Jerry! If the technology had been around I have no doubt St Paul would have been sending emails to the churches of Asia Minor, and probably would have had a website as well. In April I attended the biennial conference of the Association for Church Editors (ACE) in St Alban’s. Our first speaker was Bob Little, a free-lance journalist working for the Beds & Herts Media Trust, who gave a brief history of church magazines and then talked about how they might develop in the future. When was the first ‘church newsletter’ written? It depends how you define them. What constitutes a church magazine or newsletter? The modern variety dates from about 1790, with added impetus about 150 years ago from the movement for men’s education and literacy. There is also evidence that church magazines of a sort existed in 17th century Britain. But you could go a lot further back than that, almost 2,000 years in fact. What are St Paul’s epistles in the New Testament if not church newsletters? Writing to congregations and individuals, he encourages them on their spiritual journey, thanks them for fund-raising for his next project, and occasionally has to correct them on some point of doctrine or behaviour. We talked a bit about what purpose the church magazine serves – to inform, educate, amuse – and then we looked at the competition. As a source of information what does any printed magazine or newspaper have to compete with? Mobile phones and Blackberries were mentioned, and I would add radio, television and the Internet. The printed magazine is not superseded by these other media, but does have to have an appealing structure, relevant content, and must be presented attractively. A church is judged by its magazine, among other things, and so the magazine is a vital part of any church’s marketing strategy (outreach and mission). We thought also about our target audiences: Church of England and Free Church magazines have very different audiences. On the whole the latter are in-house and the readers are mainly members of the congregation, whereas a typical CE parish magazine serves the whole of the local community, including non-churchgoers. A telling question for editors to ask themselves is ‘Can a non-churchgoer read my magazine without being bored to tears?’. We then held a very brief AGM, followed by an excellent lunch. We had all brought copies of our own magazines, and I collected up as many others as I could to bring home for comparison. Ours is one of the more interesting and attractive of those produced on church photocopiers, but there are many out there which make ours seem quite dowdy. Perhaps we should invest in a colour photocopier (in my dreams!). Our second speaker was Arun Kataria, Diocesan Communications Officer for St Alban’s diocese. (By the way, he spoke very highly of our Gloucester diocesan magazine Inspires, edited by our DCO, Lucy Taylor.) As DCO Arun receives copies of all parish magazines in his diocese and reads them all, though not every one cover to cover every month! His opinion is that as a species the parish magazine is thriving and is very important as a source of information in local communities. Arun asked some of the usual questions: What is our strategy? Who reads our magazine? Who doesn’t read it, and why? And then the same question we had in the morning: What are we competing with? He pointed out that many of the technological advances of the last decade have been in the field of communication. Communication, spreading the good news, is part of the church’s mission, so it is important to investigate all forms of modern communication. Many parishes, including our own, have a website – but how we do use it? And how does it complement the printed magazine? And what other forms of communication do we use? Words are very important, but 55% of normal communication is visual, 38% vocal, and only 7% verbal. In the printed medium we should therefore make use of drawings and photographs. But we should also consider the other media such as audio and video, interactivity on the website, and pod-casting, which Arun said can be fantastically effective, giving anything from short trailers once a month to long articles and interviews. It was a good day, with lots of ideas for making the best use of our magazines, our websites and any other communication technology we can think of. The printed magazine, reassuringly, is by no means obsolete. This photograph by Tony Parsons is the ceiling in the choir of All Saints’ church. Tony is a member of the Cheltenham Camera Club, which held an exhibition in All Saints’ just before Easter. He was fascinated by the natural lighting in the church and decided to take some photographs using only the daylight coming through the windows. In a process known as HDR (high dynamic range), Tony used different exposures and then merged them to produce beautiful pictures which we cannot do justice to in black and white. This one was taken with the camera fixed on the horizontal plane, as if lying on the floor facing directly upwards (which is by far the easiest way to appreciate this ceiling!). I love the symmetry, and while it does look good in black and white, it is stunning in colour. You can see it (and another picture) by clicking on the image above. Tony’s photographs will also be on display in All Saints’ church, probably during June. Just as the Old Testament is made up of books of different styles of literature – history, prophecy and poetry for example, so too is the New Testament, with books about the person of Jesus (the gospels), letters to individuals or churches (epistles) and prophecy (Revelation). This short letter, just a single chapter of fourteen verses, is found towards the end of the New Testament and lies immediately before the two concluding books Jude and Revelation. 3 John is very much the length of a private letter of the time (probably towards the end of the first century AD) and it would have been written on a sheet of papyrus (about 20cm x 25cm). The author identifies himself as ‘the Elder’ writing to his friend, Gaius. We do not know whether the author was John, the apostle, or a close follower, but that need not stop us from benefitting from the message. Good practice when reading any part of scripture is to seek out the original context, then what it teaches us of God, Jesus or the Holy Spirit and finally how it applies to our personal Christian life. Regarding context – both 1 and 2 John are in part written to counter false teachings that were being circulated at the time and were threatening to deny the incarnation of Christ. It is possible that 3 John results from the same situation. It concerns hospitality offered to visiting preachers: Diotrephes was refusing to receive those whom the Elder commended and was gossiping maliciously (v9). As regards teaching, the Elder is keen that being a Christian will influence how we each live our life. Our God is a personal God. See verse 11. Perhaps recalling letters or cards you have sent, do you wish similar things to those in verse 2 to the people you correspond with? What is it that gives you great joy (v3)? How faithful are you, both as a friend and as a Christian (v5)? Do people say verse 6 of you? How do you support fellow Christians (v8)? Should you have access to this letter in full you will read that Diotrephes was putting up barriers to God’s work. He loves to be first. He will have nothing to do with the Elder. He gossips maliciously. More light is shed by these other passages: ‘Keep your tongue from evil and your lips from speaking lies. Turn from evil and do good; seek peace and pursue it.’ (Psalm 34:13-14) and ‘No-one who lives in Jesus keeps on sinning.’ (1 John 3:6). We live in the age of mobile phones, email and instant communication – but I am so glad we have access to some of the early Christian letters. And don’t you just love the personal touches in verse 13? In conclusion: the context – a letter from one Christian to another illustrating how two different men behave. One thing it teaches about God or Jesus is that faithfulness to God’s truth brings joy. How do you apply it – well that really isn’t up to me to tell you, is it? Elevate is now open to young people currently in school Year 6. Elevate is a group which explores faith and life through a wide range of games, activities and discussion. We meet 5-7pm on Sunday evenings at St Nicolas’ Church. For more information: Andy Macauly 520534. The Brownies and Guides will be taking part in our next Eucharist with a Difference at St Nicolas’on Sunday 15th June at 9.30am. All are welcome to join us. The next bakestall falls on Sunday 15th June with contributions gratefully received from the A-F surname team. It will be in aid of Victims of Torture via the Medical Foundation. In April we sent donations amounting to £50 to African appeals: Africa Now, Hope Africa and Breadline Africa. Thank you all for your support, both baking and buying. Our next Parish Lunch will take place on Sunday 20th July at 1.00pm in the function room of The Royal Oak. I shall be taking names in a short while, but this is just to let you know in advance so that you can make a note in your diaries. On Wednesday 25th June Music Scholars from Dean Close School will give a concert at 11am in St Mary’s church after coffee at 10.30am. There will be a retiring collection in aid of the Organ Fund. All are welcome. This month’s meeting takes place on Tuesday 24th June at St Nicolas’ Church at 7.30pm. Our speaker will be Mr Chris Baynham who will talk to us about The Gloucestershire Fire & Rescue Service. Any husbands or friends who may find this interesting are more than welcome to join us for this occasion. 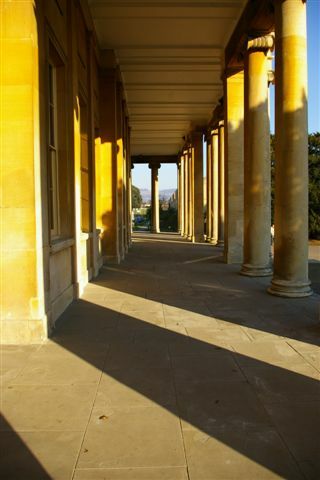 Gardeners are working hard, so bring your friends and enjoy exploring the delightful gardens. On Saturday 21st June the North Cheltenham Churches (NCC) football team is holding its annual Awards Night at Whitethorn Drive from 7.30pm by kind invitation of Sharon and Andy. On Sunday 22nd June the Revd Jon Morgan will lead a service of worship from Iona. The service is at 6.30pm in Prestbury United Reformed Church and everyone is invited to attend. There will not be a 6.30pm service in St Mary’s on this evening. On Sunday 29th June at 10.15am in Gloucester Cathedral David Gardiner will be ordained as a Deacon to serve in our Team Ministry. The Cathedral would like to know how many people might be attending the service. Please let Fr Michael know ASAP if you intend to go. Please keep the afternoon free so that you can attend the welcome tea party for our new curate, David Gardiner and his wife Sarah. This will be held in the garden of Prestbury Vicarage – let’s hope the weather’s fine! This will take place on Tuesday 22nd July, leaving St Nicolas’ Church by coach at 9.30am. We will leave Hereford at 4.30pm. Fr Paul Iles will do an afternoon guided tour of the Cathedral for those who are interested. The cost of the coach will be £8.00 return per person and at the time of going to print there are only 10 places left. If you would like to join us, you must hurry! On Saturday 6th September, as part of St Mary’s Patronal Festival, we shall walk the boundary of Prestbury Parish. Do join us for all or part of the route. If you would like to ask people to sponsor you to raise funds for Prestbury and Pittville Youth, please do so, but this is not essential. More information in next month’s magazine. You may well be wondering if we shall be having a church fete this summer. Well, the answer is yes we shall, but it will be in late summer – Saturday 13th September to be exact. It will take place on the Scout Field in The Burgage and run from 2.00pm until 5.00pm. Any ideas for new stalls and attractions will be welcome and I shall soon be compiling a list of volunteers to help on the day. Meanwhile, keep that day free in your diaries and watch the magazine for further information. Saturday 11th October at All Saints’ Church, a return visit of the much loved Abertillery Orpheus Male Choir. They have already raised a lot of money for the parish over the past few years and have kindly agreed to come again to help raise more money for the Quinquennial repair work. Please keep the date free and support us in this enjoyable venture. I would like to thank everyone who came and supported the concert given by the above choir on 26 April. Also a big thank you to my fellow choir members, Musicial Director and our accompanist for giving up their time on a Saturday evening to help raise money for my church. A profit of over £800 was made for the Building Repair Fund.